CAIRO — Echoing some of President Donald Trump's rhetoric, authorities in Egypt are taking aim at an alleged barrage of "fake news" they say is meant to sow division and undermine the rule of general-turned-president Abdel-Fattah el-Sissi. Under a new law, the state's top media regulatory agency can now use the "fake news" label to shut down social media accounts with more than 5,000 followers, without having to obtain a court order. Another new law allows blocking websites with content deemed a threat to national security. Last month, the government set up a unit tracking alleged rumors, after el-Sissi claimed without elaborating that the government had identified some 21,000 rumors having been circulated over a three-month period this year. The Cabinet often issues statements refuting purported rumors. Government critics denounce the measures as the latest attempt to suppress dissent and silence what is left of independent journalism. Over the past few months, some 500 online sites have been blocked, as part of the state's growing control over the media, according to an Egyptian watchdog, the Association for Freedom of Thought and Expression. "They (authorities) have blocked all sources of information," said Khaled el-Balshy, a prominent pro-democracy activist and former board member of the Journalists' Union. "They confiscate the media and any area of free speech, even on social media." Two of his websites were recently blocked, including one just nine hours after its June 19 launch. He said the government did not publicize the decision or provide an explanation. Trump has repeatedly accused critical media outlets of being producers of "fake news," labelling them "the enemy of the people," and only lauding those that cover him favorably. Egypt's government never said publicly that it was embracing Trump's media policies, but el-Sissi, a staunch Trump ally, has made clear that he wants to see the media united behind him. El-Sissi has alleged that Egypt and other Arab nations are being threatened by rumors. 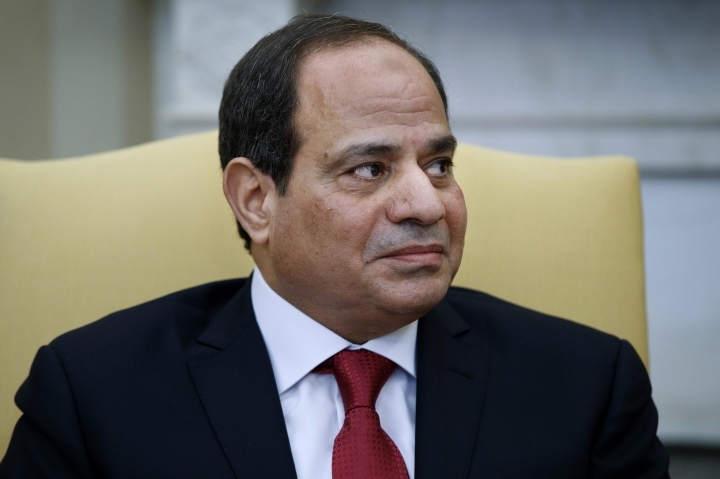 "The real danger is blowing up countries from within," el-Sissi said in July. "Rumors, terrorist acts, losing hope and frustration, all these (things) function in an incredible network aiming at one objective: to stir up people to destroy their country." In recent years, more restrictive media policies have been adopted elsewhere in the Arab world as governments crack down on social media content. The Palestinian self-rule government, for example, last year clamped down on social media and news websites — main outlets for debate and dissent in the West Bank — with a vaguely worded law that allows for charges of harming "national unity" or the "social fabric." In Egypt, officials have pointed to several recent reports on social media networks that they said were blatantly false and seemed designed to spread panic. One report claimed poisoned tomatoes were being sold in the markets. Another said authorities planned to tax bank deposits. A third rumor warned depositors that the government planned to seize their foreign currency accounts and give them their equivalent in Egyptian pounds. Not surprisingly, authorities are blaming the misinformation on the Muslim Brotherhood group, which was designated a terrorist organization after the 2013 military overthrow of President Mohammed Morsi, who hails from the group, amid mass street protest against his one-year rule. The government has treated the Brotherhood as its main domestic enemy since then. Thousands of people — mostly Islamists but also secular, pro-democracy advocates — have been jailed since 2013 as restrictions were placed on civil society groups and freedom of expression. The crackdown continues amid rising discontent over price hikes for food, transport and utilities. The government has also clamped down on independent journalists, activists and bloggers, detaining dozens who now face an array of charges, chief among which is disseminating false news, according to Mokhtar Mounir, a rights lawyer who represents several detainees. Among those detained were many social media heavyweights critical of the government, including famous blogger Wael Abbas, and political activists Hazem Abdel-Azim and Shady Harb. Earlier this year, authorities shut down an independent news site after it published an Arabic translation of a New York Times article alleging that voters in this year's presidential election were offered cash, food and promises of better services if they cast their ballots. The site's editor was arrested. Authorities said the site was operating without license and charged it with spreading false news and belonging to an outlawed group, political parlance for the Muslim Brotherhood. At about the same time, the editor of one of Egypt's popular dailies — el-Masri el-Youm — was fired over an article that catalogued state-sponsored efforts to boost the turnout in the March vote. Election authorities said the article was an "insult" to the state, several staff members along with its editor, Mohammed el-Sayed Saleh, were questioned by prosecutors and the paper was fined 150,000 Egyptian pounds ($8,400). The head of the government's new "rumor tracking unit," Naayim Saad Zaghloul, said her staff is focusing on social media. "It is fertile ground for rumors to spread, and we have personnel in the field to monitor rumors and address them immediately," she said. The state media and private, pro-government TV networks broadcast daily announcements warning against purported lies on social media. State-run Nile News TV ran an ad claiming to have identified eight fake reports within 10 days. The pro-government CBC Extra channel urged viewers not to "believe everything seen on social media."